The band was formed in 1984 by singer Mick "Red" Hucknall with three former members of the band Durutti Column - bassist Tony Bowers, drummer Chris Joyce, and keyboardist/brass player Tim Kellett - plus guitarist Sylvan Richardson and keyboardist Fritz McIntyre. The band signed to Elektra Records and released their debut album "Picture Book" in October 1985. The band line up changed over the years. By 1996, after their fifth album "Life", Mick Hucknall was the only remaining original member, and the name Simply Red had become a trademark for him. 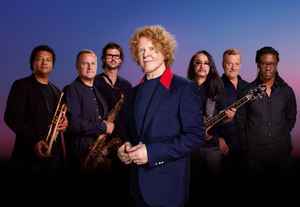 After being dropped by their label EastWest in 2000, they established a website simplyred.com which also became their own label and released the album "Home" in 2003 and all subsequent releases under it. Hucknall retired the name Simply Red after a farewell tour in 2010, but reunited in 2015 for a tour that marked the 30th anniversary of the band, and released the album "Big Love". Their biggest hits are "Money's Too Tight (To Mention)", "Holding Back The Years" (1985), "The Right Thing" (1987), "It's Only Love", "If You Don't Know Me By Now" (1989), "Something Got Me Started", "Stars" (1991), "Fairground" (1995) and "Sunrise" (2003). After being a Frantic Elevator for sometime in the early 80s, Mick Hucknall formed Simply Red with members of the early Durutti Column line-up (the one that recorded for Factory Sample EP). With three excellent pop albums ('Picture Book', 'Men & Women' and 'A New Flame') nineties saw rapid line-up changes finally featuring Hucknall as a sole representator with his, now-obvious alter ego. 'Stars' did not disappoint, but with every next album it was more and more a self-indulgent affair obscured with Hucknall's excellent but often affecting vocals that reached certain degree of irritation. Now heavily into the new millenium's plastic r'n'b Simply Red or whatever remained of 'them' sound no longer as distinctvie as they once were.